^ Crystal, David (2006). The Fight for English. オックスフォード大学出版局. p. 172. ISBN 978-0-19-920764-0. ^ Hince, Bernadette (2000). The Antarctic Dictionary. CSIRO Publishing. p. 6. ISBN 978-0-9577471-1-1. http://books.google.com/?id=lJd8_owUxFEC&pg=PA6&lpg=PA6&dq=antarctica+opposite+of+north+greek. ^ Liddell, Henry George; Scott, Robert, “Antarktikos”, in Crane, Gregory R. (英語), A Greek–English Lexicon, Perseus Digital Library, タフツ大学, http://www.perseus.tufts.edu/hopper/text?doc=Perseus%3Atext%3A1999.04.0057%3Aentry%3D%239514 2012年6月14日閲覧。 . ^ a b Stonehouse, B., ed (June 2002). 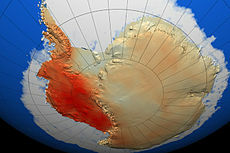 Encyclopedia of Antarctica and the Southern Oceans. John Wiley & Sons. ISBN 0-471-98665-8. ^ Smith, Nathan D.; Pol, Diego (2007). “Anatomy of a basal sauropodomorph dinosaur from the Early Jurassic Hanson Formation of Antarctica” (英語) (PDF). Acta Palaeontologica Polonica 52 (4): 657–674. http://www.app.pan.pl/archive/published/app52/app52-657.pdf 2012年6月14日閲覧。. ^ DeConto, Robert M.; Pollard, David (2003-01-16). “Rapid Cenozoic glaciation of Antarctica induced by declining atmospheric CO2” (英語). Nature 421 (6920): 245–9. doi:10.1038/nature01290. PMID 12529638. http://www.nature.com/nature/journal/v421/n6920/abs/nature01290.html 2012年6月14日閲覧。. ^ a b Trewby, Mary, ed (September 2002). Antarctica: An Encyclopedia from Abbott Ice Shelf to Zooplankton. Firefly Books. ISBN 1-55297-590-8. ^ Drewry, D. J., ed (1983). Antarctica: Glaciological and Geophysical Folio. Scott Polar Research Institute, University of Cambridge. ISBN 0-901021-04-0. ^ “Владимир Петраков: 'Антарктика – это особая атмосфера, где живут очень интересные люди'” (ロシア語). 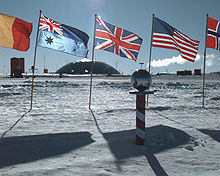 2012年6月14日閲覧。 (Vladimir Petrakov: "Antarctic is a special world, full of very interesting people"). Interview with Father Vladimir Petrakov, a priest who twice spent a year at the station. 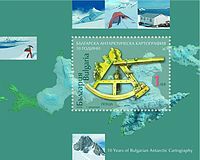 ^ Old Antarctic Explorers Association. “[title missing”]. Explorer's Gazette 9 (1). オリジナルの2011年7月23日時点によるアーカイブ。. https://web.archive.org/web/20110723231425/http://www.oaea.net/Volume9%2CIssue1.pdf. ^ Antarctic Treaty, Art. 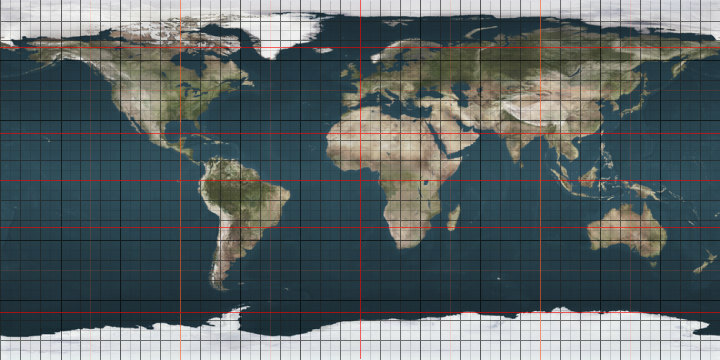 VI ("Area covered by Treaty"): "The provisions of the present Treaty shall apply to the area south of 60° South latitude." ^ Bridge, Paul D.; Spooner, Brian M.; Roberts, Peter J. (2008). “Non-lichenized fungi from the Antarctic region” (英語). Mycotaxon 106: 485–490. http://www.cybertruffle.org.uk/cyberliber/59575/0106/0485.htm 2012年6月14日閲覧。. ^ de Hoog, G.S. (2005). “Fungi of the Antarctic: evolution under extreme conditions”. Studies in Mycology 51: 1–79. ^ Bridge, Paul D.; Hughes, Kevin. A. (2010). “Conservation issues for Antarctic fungi” (英語). Mycologia Balcanica 7 (1): 73–76. http://www.cybertruffle.org.uk/cyberliber/59687/0007/001/0073.htm 2012年6月14日閲覧。. ^ Morris, Michael (1988) (英語). The Strait of Magellan. Martinus Nijhoff Publishers. p. 219. ISBN 0-7923-0181-1. http://books.google.com/?id=vqZJLAOnj58C&pg=PA145&lpg=PA145&dq=brazil+antarctica+zone+of+interest#v=onepage&q=brazil%20antarctica%20zone%20of%20interest&f=false 2012年6月14日閲覧. 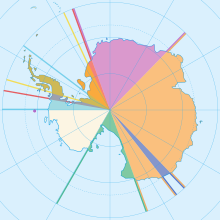 "...Brazil has even designated a zone of Antarctic interest that overlaps the Argentine sector but not the Chilean one..."
^ Rignot, E. (2004). “Accelerated ice discharge from the Antarctic Peninsula following the collapse of Larsen B ice shelf”. Geophysical Research Letters 31 (18). doi:10.1029/2004GL020697. ISSN 0094-8276. ^ a b Shepherd, A.; Wingham, D. (2007). “Recent Sea-Level Contributions of the Antarctic and Greenland Ice Sheets”. Science 315 (5818): 1529–1532. doi:10.1126/science.1136776. ISSN 0036-8075. ^ a b c Rignot, Eric; Bamber, Jonathan L.; van den Broeke, Michiel R.; Davis, Curt; Li, Yonghong; van de Berg, Willem Jan; van Meijgaard, Erik (2008). 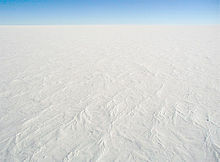 “Recent Antarctic ice mass loss from radar interferometry and regional climate modelling”. Nature Geoscience 1 (2): 106–110. doi:10.1038/ngeo102. ISSN 1752-0894. ^ Chen, J.L. ; Wilson, C.R. ; Tapley, B.D. ; Blankenship, D.; Young, D. (2008). “Antarctic regional ice loss rates from GRACE”. Earth and Planetary Science Letters 266 (1-2): 140–148. doi:10.1016/j.epsl.2007.10.057. ISSN 0012821X. ^ Steig, Eric J.; Schneider, David P.; Rutherford, Scott D.; Mann, Michael E.; Comiso, Josefino C.; Shindell, Drew T. (2009). 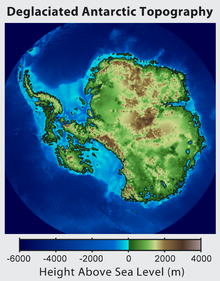 “Warming of the Antarctic ice-sheet surface since the 1957 International Geophysical Year”. Nature 457 (7228): 459–462. doi:10.1038/nature07669. ISSN 0028-0836. ^ Gillett, Nathan P.; Stone, Dáithí A.; Stott, Peter A.; Nozawa, Toru; Karpechko, Alexey Yu. ; Hegerl, Gabriele C.; Wehner, Michael F.; Jones, Philip D. (2008). “Attribution of polar warming to human influence”. Nature Geoscience 1 (11): 750–754. doi:10.1038/ngeo338. ISSN 1752-0894. ^ Payne, Antony J.; Vieli, Andreas; Shepherd, Andrew P.; Wingham, Duncan J.; Rignot, Eric (2004). 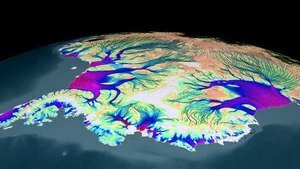 “Recent dramatic thinning of largest West Antarctic ice stream triggered by oceans”. Geophysical Research Letters 31 (23). doi:10.1029/2004GL021284. ISSN 00948276. ^ Thoma, Malte; Jenkins, Adrian; Holland, David; Jacobs, Stan (2008). “Modelling Circumpolar Deep Water intrusions on the Amundsen Sea continental shelf, Antarctica”. Geophysical Research Letters 35 (18). doi:10.1029/2008GL034939. ISSN 0094-8276. ^ Pritchard, H., and D. G. Vaughan (2007). “Widespread acceleration of tidewater glaciers on the Antarctic Peninsula”. Journal of Geophysical Research 112. doi:10.1029/2006JF000597. ^ a b c Schiermeier, Quirin (2009-08-12). “Atmospheric science: Fixing the sky” (英語). Nature (Nature Publishing Group) 460: 792–795. doi:10.1038/460792a. http://www.nature.com/news/2009/090812/full/460792a.html 2012年6月14日閲覧。. ^ Turner J., Comiso J.C., Marshall G.J., Lachlan-Cope T.A., Bracegirdle T., Maksym T., Meredith M.P., Wang Z., Orr A. (2009). “Non-annular atmospheric circulation change induced by stratospheric ozone depletion and its role in the recent increase of Antarctic sea ice extent”. Geophysical Research Letters 36 (8): L08502. Bibcode: 2009GeoRL..3608502T. doi:10.1029/2009GL037524.